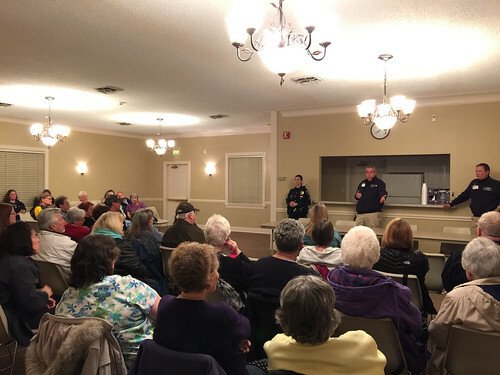 Thank you to everyone who attended the Speedway Police Department’s Neighborhood Watch meeting, held on Thursday, March 3, 2016. It was an excellent turnout, and we appreciate everyone for attending. Sgt. Mirantha Wilson introduced Joe Kramer and John Merritt of the Code Enforcement Division of the Speedway Police Department. Officer Kramer explained to the residents of several concepts and duties of the Code Enforcement Division. Kramer advised the group that there was a team concept which involved all the different agencies within the town such as the police & fire department, street department, sanitation and water department. Kramer explained since the arrival of the new Town Manager Ian Nicolini there are monthly staff meetings and reviews involving all the department heads and discussions on current town projects, new ideas and development to help serve and keep the town a safe and clean community. Kramer discussed other towns and cities are mentoring what our Code Enforcement Division is doing and accomplishing. 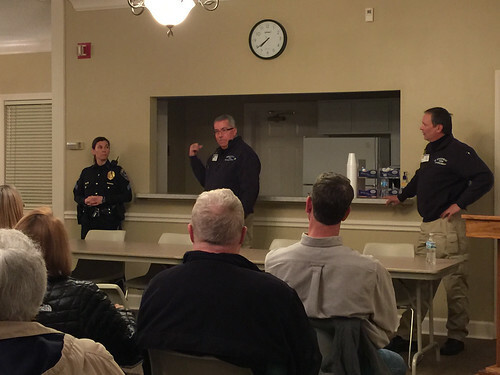 Along with that, Officer Kramer and Merritt were asked to speak at this year’s Indiana Associations of Cities and Towns which is being hosted in downtown Indianapolis. Officer Kramer spoke of the top complaints in the town as far as code enforcement and those were overgrown grass, not to exceed 6 inches, debris, trees, abandoned vehicles, animal complaints, right of way issues, and parking. The parking complaints were of those people parking their vehicles in their yards and those who park the wrong way facing oncoming traffic. These are not permissible and are subject to a $50.00 for each separate offense. Officer Kramer also stated the town’s ordinances were under review with two titles complete and approved by the Town Council. Kramer advised the Town Council has been very forthcoming of revising and updating our ordinances to improve our town’s quality of life. Officer John Merritt is the Town’s Building Commissioner and also is a code enforcement officer. Mr. Merritt spoke of what type of building permits are required by the town. Mr. Merritt explained that if you were conducting a renovation, building a deck, barn, home or garage addition or new construction, a permit would be required. Mr. Merritt encouraged when in doubt call him and if your project requires or doesn’t require a permit he would let you know. Mr. Merritt advised how Speedway is unique in that when you purchase a permit you get service with an inspection for each permit issued. Each inspection assures that you as the homeowner are getting the quality of work you paid for by your contractor. Mr. Merritt also advised that there are three other members of his team. These members are Kevin Schrader, who inspects the electrical permits and Jim Fink, who inspects the plumbing. Brent Schneider, a new resident of our town, and a 20 year building official backs up all members of the team when needed. Mr. Merritt expressed how the division picks up signs in the right of way of businesses or people selling things and advertising. This also includes the signs people put on utility poles. Mr. Merritt confirmed the team concept of not only the town employees but that of the townspeople who reside in our town. Mr. Merritt stated our division is here to work with all our residents and businesses to build a strong community. The Code Enforcement officers were thrilled of how many residents attended the meeting. The officers encouraged the community to call if they have a complaint or questions.